If you work in an office with central air conditioning and heating, then you are probably freezing your @$$ off this month at the office while the systems transition from summertime cooling to heating (which is on for the other nine months of the year). 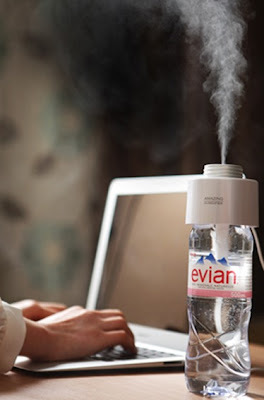 In case you're wondering that is a portable humidifier that sits atop a water bottle and plugs into a USB port. 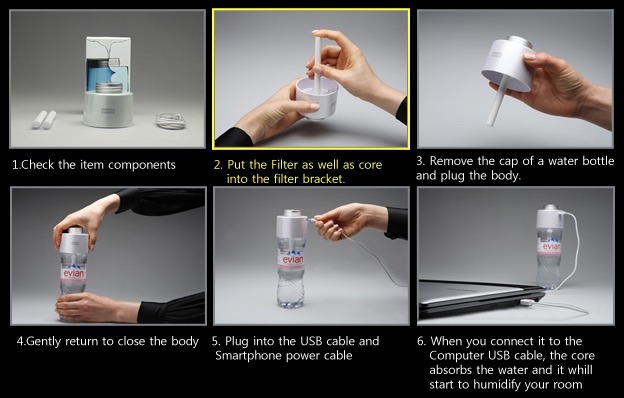 And look at the design: Pop in a filter, add a couple of drops of essence to the water if you so choose, and plug it in. Honestly, it doesn't get much simpler than that. It has an auto-shutoff feature (after 8 hours) and it's quiet. Simple, elegant and simple. Love. This little gadget runs for USD$29. You can check out the Amazing Grace website or their Facebook page for info but it seems that it's easiest to purchase via Amazon.